The BAG Project will closed on Friday, March 16th. Have good Spring Break! Follow us on Facebook, as the Begin Again Group. Thank you! The Begin Again Group, or B.A.G. Project, supports refugee women to begin new lives in Canada. The group makes eco-friendly, vegan purses and designer bags out of recycled rubber. 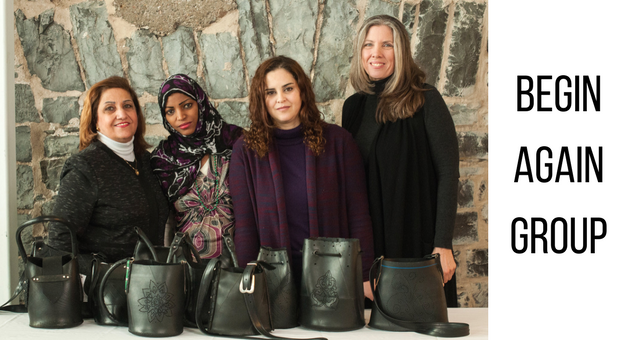 Each bag purchased supports newcomer women and their families. Visit the B.A.G. Project at the Tett Centre on Friday afternoons between 12:30pm and 4:30pm in the Flex Studio, Creativity Studios. The Begin Again Group, or B.A.G. Project, is a micro-enterprise created in collaboration with Carolyn Butts of Bon Eco Design and KEYS Job Centre in Kingston, Ontario. The initiative aims to engage refugee women in Kingston by providing support and training in business, design, fabrication, marketing and sales. The B.A.G. Project represents a new beginning for both material and maker. To support the project, buy a bag! Or contact info@keys.ca for more information. Looking for ways to support the project? Visit the Tett Centre on Friday afternoons between 12:30-4:30pm to see the making process or purchase a bag. For mentorship options in support of newcomers in our community, contact KEYS Job Centre, info@keys.ca. We are deeply indebted to the financial and in-kind support from our funders and community partners: the Ontario Ministry of Citizenship and Immigration, the Community Foundation of Kingston and Area, the Kingston Frontenac Public Library and the Tett Centre for Creativity and Learning.